The System of Rice Intensification: Responses to Frequently Asked Questions, a 222 page book (right), was published during December and is now available for purchase on Amazon.com for $41.33 (€38.33). The publication was authored by Norman Uphoff, the SRI-Rice senior advisor. 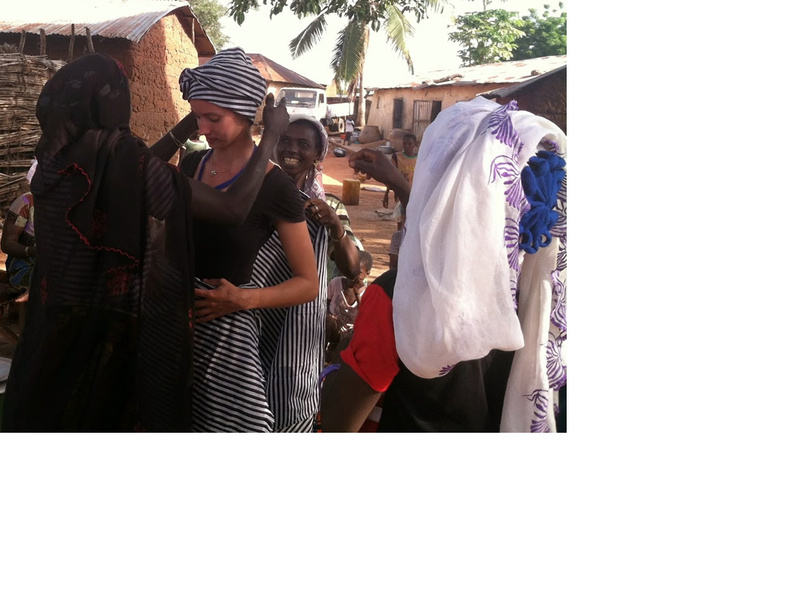 During December 14-16, Erika Styger and Devon Jenkins conducted a national training of SRI trainers in The Gambia. 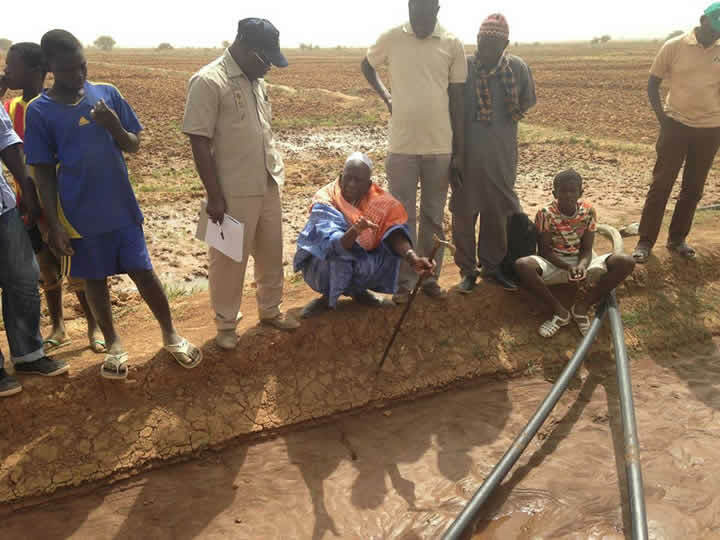 They also visited farmers, and made related support visits to the Ministry of Agriculture, the Peace Corps, and the WAAPP Office in The Gambia December 10-13. Our SRI-Rice Selected News Updates for November (on ScoopIt) as well as the November additions are now available. November statistics are as follows: 4,418 unique visitors from 106 countries logged 5,759 sessions in which 11,332 pages were viewed. Our primary Facebook page now has 1,780 "likes," the SRI Equipment Innovators Exchange has 260 members (4 new) and our primary YouTube channel, which now has 201 total followers, had 1,302 new views (57,752 for past 5 years) for our 65 uploads (2,019) views of our 27 playlists. The twitter account has 35 new followers this month (1,301 total followers). Slideshare had 11,860 views of our 44 uploads; 192 followers. There are 796 items in our Zotero research database. Erika Styger and Devon Jenkins facilitated a regional workshop together with Gaoussou Traore, CNS-Riz Director, in Dakar, Senegal, December 7-8 for the SRI-WAAPP project in West Africa. Lotus Foods matched the first $500 of the SRI-Rice year-end giving fundraiser on the one-day "Giving Tuesday" follows black Friday that is intended to spur year-end donations to non-profit organizations. Our donation page reflects our campaign message of six reasons to giv e to SRI-Rice. Our SRI-Rice Selected News Updates for October (on ScoopIt) as well as the October additions are now available. October statistics are as follows: 3,972 unique visitors from 102 countries logged 5,143 sessions in which 9,386 pages were viewed. Our primary Facebook page now has 1,736 "likes," the SRI Equipment Innovators Exchange has 256 members (4 new) and our primary YouTube channel, which now has 192 total followers, had 1,220 new views (56,484 for past 5 years) for our 65 uploads 2,352 views of our 27 playlists. The twitter account has 33 new followers this month (1,264 total followers). There are 776 items in our Zotero research database. The chair of the Cornell University board of trustees, Bob Harrison (right), in his speech just before the new Cornell President’s State of the University address, mentioned SRI as the first out of four examples on Cornell’s leading role in fighting global poverty. The SRI mention is at minute 9:50-10:25 in the Cornell 2015 Joint Annual Meeting and State of the University Address video. The SRI-Rice associate director briefly met with Mr. Harrison following the event. SRI-Rice was represented by Norman Uphoff at the The Norman E. Borlaug International Symposium (The Borlaug Dialogue) in which the World Food Prize is announced, in Des Moines, Iowa, October 14-16, 2015. On October 14, Uphoff joined an evening panel arranged by Oxfam on Small farmer empowerment, resilience: The potential and reality of crop intensification. The panel was moderated by Danielle Nierenberg (Food Tank), also included, Caryl Levine (Lotus Foods), and Vara Prasad (Feed the Future Sustainable Intensification Innovation Lab, Kansas State University). Norman and Marguerite Uphoff also helped to staff the table on SRI/SCI that Oxfam America sponsored at the World Food Prize events on October 15 and 16. The WFP this year was given to Sir Fazle Abed, founder and director of BRAC in Bangladesh, who was one off the first persons in Bangladesh to take an interest in SRI. SRI-Rice's senior advisor delivered an oral presentation and a poster on the System of Tef Intensification in Ethiopia and SCI in general on October 13 at the 2nd International Conference on Global Food Security held in Ithaca, NY, October 11-14, 2015. The presentation, which was co-authored by Tareke Berhe, Ayele G. Ayetenfisu, and Zewdie Gebretsadik, was entitled The System of Tef Intensification: Opportunities for greater food security in Ethiopia and elsewhere through modifications in crop management. Our SRI-Rice Selected News Updates for September (on ScoopIt) as well as the September additions are now available. September statistics are as follows: 3,852 unique visitors from 100 countries logged 4,872 sessions in which 9,387 pages were viewed. Our primary Facebook page now has 1,708 "likes," the SRI Equipment Innovators Exchange has 251 members (38 new) and our primary YouTube channel, which now has 189 total followers, had 1,226 new views (55,111 for past 5 years) for our 65 uploads (1,353) views of our 27 playlists. The twitter account has 24 new followers this month (1,231 total followers). There are 776 items in our new Zotero research database. Devon Jenkins made a presentation entitled Improving Agricultural Innovation in West Africa with GIS and Mobile Data Collection on October 13 at the Cornell Geospatial Forum, held in Martha Van Rensselaer Hall G71 on the Cornell campus. The presentation covered his work using ArcGIS and mobile data collection for SRI sites in the 13 West African countries included in the SRI-WAAPP project. Abha Mishra, team leader for the EU-funded project on Sustaining and Enhancing the Momentum for Innovation and Learning around the SRI in the Lower Mekong River Basin (SRI-LMB) gave a SRI-Rice-sponsored talk on October 12 entitled Farmer Adaptation of System of Rice Intensification (SRI) Methods in the Lower Mekong Basin Region (see PowerPoint). Dr. Mishra will also present at the 2nd International Conference on Global Food Security held in Ithaca, NY, on October 14, 2015. Gaoussou Traoré, head of the National Center of Specialization (NCOS) on rice in Mali and Director of Research and Scientific Coordinator Institut d’Economie Rurale in Bamako, visited the USA during September in conjunction with the Scaling Up SRI in West Africa Project, for which SRI-Rice provides technical expertise. Together with Erika Styger, he gave several presentations on this 3-year project, which is an undertaking of the World Bank-sponsored West Africa Agricultural Productivity Program (WAAPP). 1) Sept. 15: a SRI-Rice-sponsored seminar at Cornell University entitled Developing and Scaling up the System of Rice Intensification (SRI) in West Africa: A Success Story (see PowerPoint presentation). 2) Sept. 17: a presentation on the SRI-WAAPP experience hosted by the Agriculture Global Practice and the Sustainable Agriculture Systems, Knowledge, and Institutions (SASKI) Thematic Group at the World Bank in Washington D.C.
3) Sept. 18, a presentation at Oxfam's Washington D.C. office entitled "Scaling the System of Rice Intensification in West Africa: Opportunities, Challenges and Lessons Learned." The Cornell Conservation Agriculture group which partners with SRI-Rice for online communications, has released the latest CA Research Highlights for August. The news update is available directly through ScoopIt or through the CA website. Rena Pérez, who was visiting Cornell from Cuba, presented a talk on SRI and its Adaptation to Sugarcane in Cuba on September 9. (Click on flyer at right for details; see also PowerPoint presentation.) She was accompanied by her family who came to Ithaca to celebrate her 80th birthday at Cornell, from which she graduated in 1954. Our SRI-Rice Selected News Updates for August (on ScoopIt) as well as the August additions are now available. During August 2015, 3,924 unique visitors (4,048 last month) from 100 countries (90 last month) viewed 9,311 pages (10,222 last month) on the SRI website. Total Facebook all-time likes 1,670 (36 new this month). Twitter followers: 1,107 (26 new this month). Total YouTube views: 54,028 all-time (1,283 new this month). Slideshare: 7,801 views this month (495,364 total for past 5 years), 436 slideshows/posters uploaded and 183 subscribers. There are 759 items in our Zotero research database. We now have 213 (12 new) members of the SRI Equipment Exchange as of the end of August! While at the SE Asia SRI Conference in Malaysia, Erika Styger interviewed several of the participants for the SRI-Rice Interview Collection. Bethany uploaded videos of Hoang Van Phu from Vietnam, Sanjeewanie Ginigaddara from Sri Lanka, Budi Setiawan from Indonesia, and Wan Mohtar Wan Yusoff from Malaysia. The entire playlist is on our SRI-Rice YouTube channel. SRI-Rice welcomed new and returning students to the SRI-Rice family during early September. 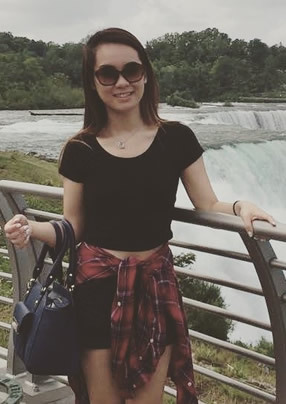 Our research curation project now includes Nina Lin, a freshman who will work with the database entry, Kevin Sim, an international agriculture senior who will curate Indonesian research, and Sean Finnerty, who has returned from Ethiopia to manage the research intake process. Social media and website assistance will be provided by Bethany Boyer-Rechlin, a new MPS student in the International Agriculture Program, and Kevin Sim. Devon Jenkins traveled to Dakar, Senegal, to facilitate a regional technical workshop on ArcGIS and mobile data collection for participants from the 13 West African countries included in the SRI-WAAPP project. The event, which will be held August 3-6, 2015, will include national facilitators, M&E officers, and SRI champions associated with SRI-WAAPP. Nolan Edmondson (right), intern with both the NGO SRI Global and SRI-Rice, completed his project on SRI news material published on the internet between 2012 and 2015. He presented his findings at Cornell University at 3PM on July 30. The media analysis project helped our organizations to refine our strategy for reaching our various audiences with timely and relevant SRI content and to identify journalists and online publications with a strong interest in sharing SRI information. Dr. Nguyen Nghia, who was visiting SRI-Rice from Cantho University, Vietnam, gave a talk entitled "Development of integrated Azolla-rice-duck-fish farming systems with SRI methods for rice production in the Mekong River region" on Wednesday, July 1, at 1:00PM in Mann Library on the Cornell campus. (See PowerPoint presentation.) He also met with the SRI-Rice team on July 1-2 regarding his upcoming SRI projects that are funded by the Toyota Foundation. Our SRI-Rice Selected News Updates for June (on ScoopIt) as well as the June additions are now available. During the June 2015, 5,180 unique visitors (4,805 last month) from 97 countries (102 last month) viewed 9,469 pages (10,805 last month) on the SRI website. Total Facebook all-time likes 1,635 (36 new this month). Twitter followers: 1,142 (26 new this month). Total YouTube views: 51,565 all-time (1,262 new this month). Slideshare: 6,748 views this month (480,191 total for past 5 years), 432 slideshows/posters uploaded and 170 subscribers. There are 643 items in our Refworks research database. We now have 199 (7 new) members of the SRI Equipment Exchange as of the end of June! Jeevan Gyawali (right), who worked with SRI-Rice communications strategies, graduated from Cornell in May and has accepted a job with GE in Texas. We wish him well!. John Lowry, who also worked with SRI-Rice communications efforts, is working with development projects in Maharashtra, India, for the summer. Nolan Edmondson has joined us for June and July as an intern for the joint SRI Global / SRI-Rice Media Analysis and Strategies Project. 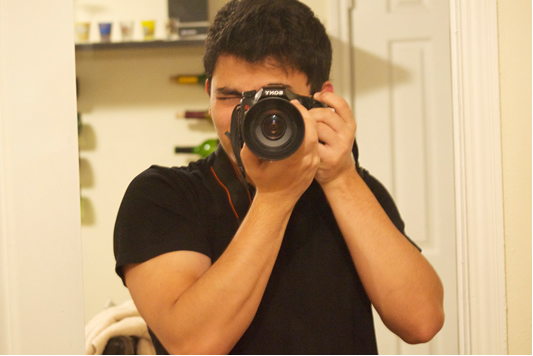 Prabhat Gautam will be spending the summer providing database support for the SRI Global Research Network. A regional SRI workshop on the monitoring and evaluation system of the SRI WAAPP project was held in Cotonou, Benin May 30-June 5, 2015, in Cotonou, Benin. The CNS-Riz/WAAPP-sponsored workshop, was facilitated by Erika Styger and Devon Jenkins, who provided follow-up and updating of the project's monitoring and evaluation system, introduced of online data collection tools and provided training on the use of ArcGIS. Erika Styger travels to Siem Reap, Cambodia, to attend the Regional Review and Planning Workshop (year 2015) for the project on Sustaining and Enhancing the Momentum for Innovation and Learning around the System of Rice Intensification (SRI) in the Lower Mekong River Basin (SRI-LMB). Her presentation is entitled Improving and Scaling Up SRI in West Africa: Insights from a regional, 13-country project. SRI-Rice is sponsoring fourteen participants to the Southeast Asia Regional Conference on SRI to be held in Alor Setar, Malaysia, on May 25-28, 2015. The sponsored participants are from Indonesia, Myanmar, Philippines, Thailand, USA and Vietnam. Erika Styger will give the keynote address at the event and Lucy Fisher will join the forum "Positioning SRI in the Context of Sustainable Development" as a panelist. SRI-Rice will also sponsor side events for 1) Asian participants in the Arsenic Project, 2) the SRI Global Research Network and 3) for representatives of the SRI national networks in SE Asia. 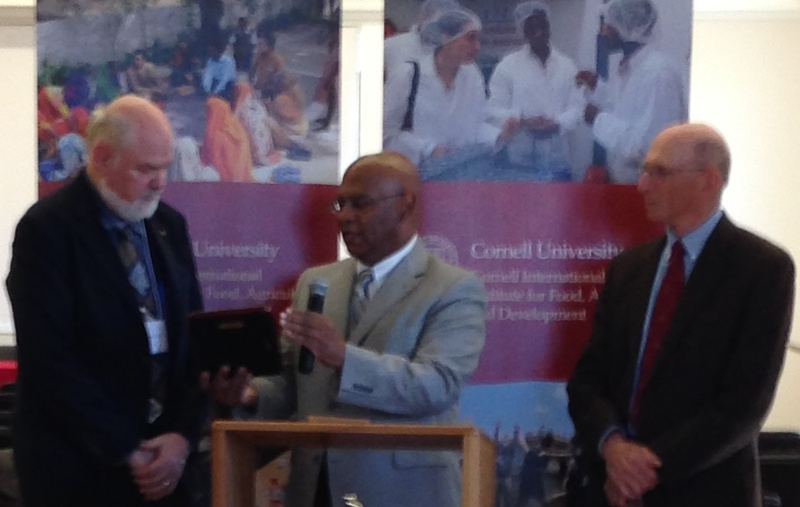 Members of the Cornell Community were urged to "think global, celebrate local" at an event hosted by International Programs / CALS to recognize Norman Uphoff''s tireless work with SRI that led to the Olam International Prize for Innovation in Food Security. Uphoff accepted the award on behalf of SRI International Network and Resources Center (SRI-Rice) on March 16 at the Global Science Conference for Climate-Smart Agriculture in Montpellier, France. 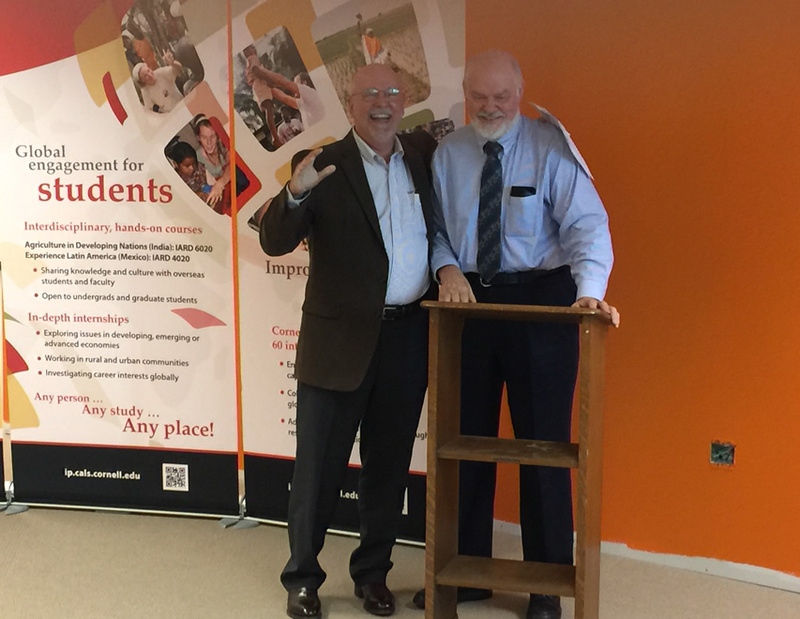 He is shown at right with Ronnie Coffman, the International Programs / CALS director at Cornell. Lucy Fisher made a presentation about the Cornell's SRI and Conservation Agriculture websites, social media, and associated research databases at the Agriculture Network Information Collaborative (AgNIC) Annual Conference, held May 6-7, 2015, at the National Agriculture Library in Beltsville, Maryland. The SRI and Conservation Agriculture websites that are maintained by SRI-Rice are both recognized at AgNIC partner sites. Sekhar Bhadsavle, who has been working on a new method of raised bed rice cultivation in India, presented a SRI-rice-sponsored seminar at Cornell University on May 5. His talk, entitled, Growing No-Till Rice with SRI: Increasing Productivity with the Saguna Rice Technique was held 4:00-5:00 PM in 135 Emerson. (See presentation). 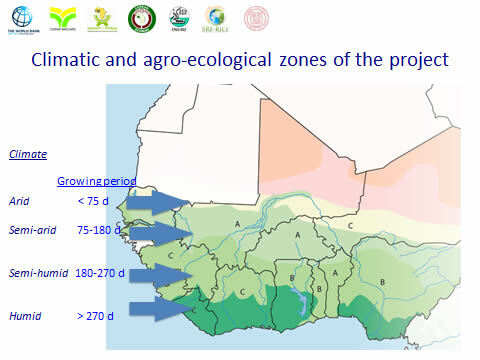 Erika Styger gave a talk entitled "Présentation du Centre SRI-Rice de l’Université Cornell et Perspectives de Collaboration" at the Regional Planning Workshop of the National Center of Specialization of Rice (CNS-Riz): West Africa Agricultural Productivity Productivity Program, held April 27-30, 2015, at CICB, Bamako, Mali. 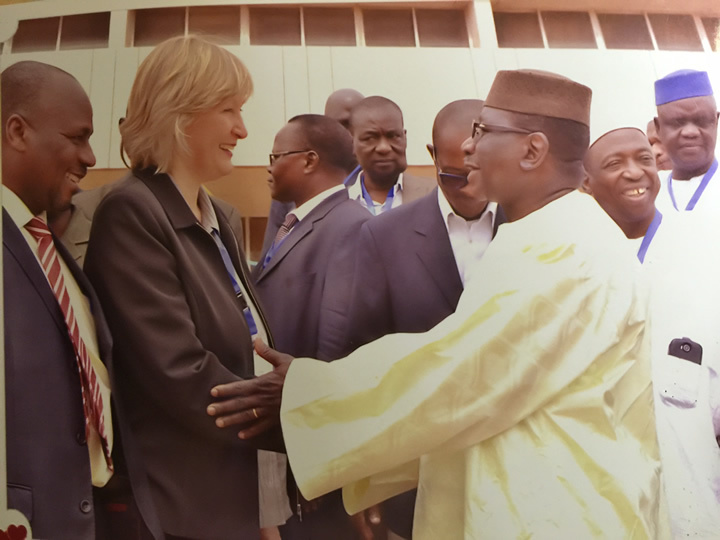 She is shown at left with the Minister of Rural Development of Mali, Dr. Bokary Treta, who was also attending the event. Kan Chun-E Kan, a professor at National Taiwan University, presented a SRI-rice-sponsored seminar at Cornell University on April 16. His talk, entitled, The System of Rice Intensification in Taiwan: Adapting SRI to Existing Farming Systems and Making Links with the Private Sector, was held 4:00-5:00 PM on April 16 in 100 Mann Library. 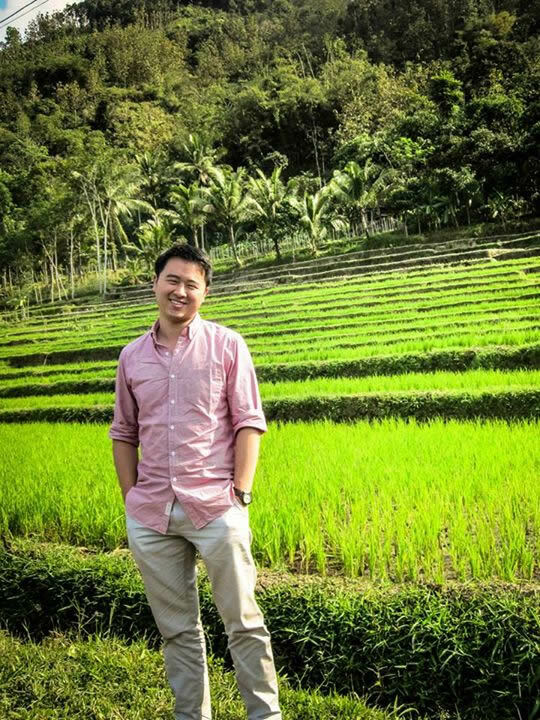 Dr. Kan, who is visiting Cornell during April, described a conceptual framework of SRI collaboration for large-scale paddy farming in Taiwan. SRI-Rice Senior Advisor Norman Uphoff won the 2015 Clifton Wharton, Jr., Emerging Markets Award on April 15 in a ceremony in 401 Warren Hall on the Cornell University campus. The award was presented by Ralph Christy, current director of CIIFAD, following the CIIFAD International Symposium Panel on Inclusive Value Chains and Economic Progress and the Student Multidisciplinary Applied Research Teams (SMART) Poster-Paper Session. The Wharton award was created in 2007 to honor the outstanding work of Dr. Clifton R. Wharton, Jr., in the areas of Philanthropy, higher education, business and public policy. Two previous award winners, Dr. Maldan Nesheim and Dr. Robert Herdt, were on hand for the ceremony. 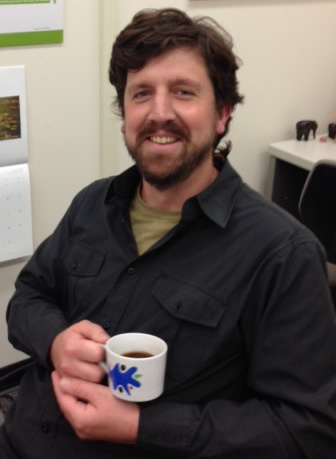 Over the past decade, Norman Uphoff has authored and coauthored numerous publications about SRI. Now, his list of publications is accessible from our general publications page. The SRI-Rice Senior Advisor presented a video keynote address to the National Consultation on "System of Rice Intensification for Increased Productivity and Ecological Security," which was held April 6-7, 2015 at the Govind Ballabh Pant Social Science Institute in Allahabad, Uttar Pradesh, India. Two articles on SRI in Taiwan and Central China were published in early online editions during March 2015. Wei Wu, Jianliang Huang, Farooq Shah, and Norman Uphoff authored the article Evaluation of System of Rice Intensification methods applied in the double rice-cropping system in Central China, which was published in Advances in Agronomy on March 20 (hard copy in press). A second article by Yu-Chuan Chang, Norman T. Uphoff, and Eiji Yamaji, entitled A conceptual framework for eco-friendly paddy farming in Taiwan, based on experimentation with System of Rice Intensification (SRI) methodology, was published in Paddy and Water Environment. SRI-Rice maintains the Conservation Agriculture Research and Resources website in collaboration with the CU Conservation Agriculture Group at Cornell. In addition to curating news, extension material and a research database with material in five languages, the website uploads and maintains back issues of Jeff Esdaile's Two-Wheel Tractor Newsletter. For those of you who are interested in smallholder agriculture, don't miss the March edition that just went up! Norman Uphoff presented "A review of contributions that the System of Rice Intensification (SRI) can make" at the Third Global Science Conference on Climate - Smart Agriculture (CSA), was held in Montpellier, France, March 16-18, 2015. Cornell Gift Fund Now Accessible through the SRI-Rice website! Those who would like to get involved with SRI-Rice can now show their support by donating through our new gift fund administered through Cornell University. More information on how to donate is available on our donation page. It's easy! A new blue button (right) on our home page will lead you to more information on how to help support SRI-Rice outreach, research and information resources. Our SRI-Rice Selected News Updates for February (on ScoopIt) as well as the February additions are now available. During the February 2015, 3,956 unique visitors from 90 countries viewed 9,980 pages on the SRI website. Total Facebook views: 1,191 with 1,537 all-time likes. Twitter followers: 1,028. Total YouTube views: 46,180 (1,146 new this month). Slideshare: 426 slideshow and poster presentations uploaded and 159 subscribers. There are 676 items in our Refworks research database. (These also appear in the Mendeley SRI Research Network site.) We now have 163 (7 new) members of the SRI Equipment Exchange as of the end of February! On March 12, Erika Styger and Norman Uphoff participated in a two-hour video-conference with the Minister of Agriculture Luis Felipe Arauz Cavallini and twelve members of the Ministry of Agriculture and Livestock (MAG), along with representatives from the Institute for Innovation and Transfer of Agricultural Technology, (INTA) and the Rice Corporation (CONARROZ). SRI-Rice made a presentation about SRI and answered questions from the participants. As part of the 13-country SRI-WAAPP project, SRI-Rice conducts periodic support trips to participating countries and provide technical assistance as requested by the host countries. Devon Jenkins traveled to Senegal and co-facilitated two SRI trainings of trainers for ANCAR agents and local NGO staff in the Casamance and the southern Peanut Basin (which is also the target zone for SRI-WAAPP project activities in Senegal), visited with staff and farmers working with PRODAM on a large SRI project in the Matam area (right), and met with UCTF/WAAPP, Peace Corps, ANCAR and IED Afrique in Dakar. Devon was accompanied by the SRI-WAAPP National Facilitator Abdoulaye Sy (ANCAR) and UCTF/WAAPP Senegal's Technical Expert Mour Guèye. 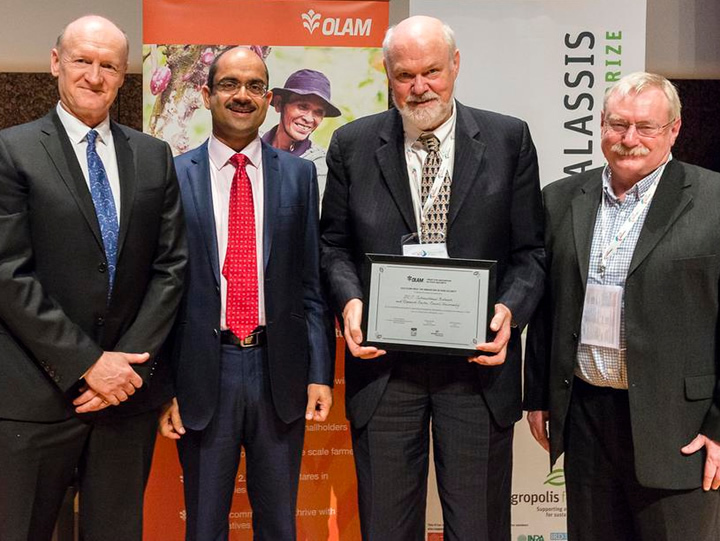 According to a press release from Olam International, SRI /SCI is one of two finalists for the inaugural Olam Prize for Innovation in Food Security. The award, in partnership with Agropolis Fondation, is one of four initiatives launched to mark Olam’s 25th anniversary. The finalists have been recognized for their innovation which carries a significant impact on the availability, affordability and accessibility or adequacy of food. The winner will be announced on March 16 at the Global Science Conference for Climate-Smart Agriculture in Montpellier, France. An article on the Farming First website also provides details of the award and the finalists. 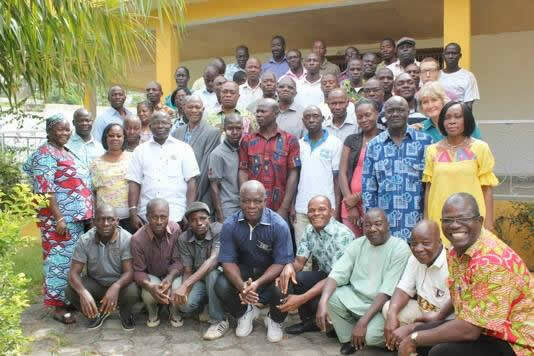 An SRI training of trainers workshop was organized by FIRCA/WAAPP from February 22-24 in Yamoussoukro, Côte d’Ivoire, regrouping more than 60 participants, extension staff and farmers from all over the country. The trainers included Alphonse Bouet from CNRA and a team from the regional coordination unit, Minamba Bagayoko from CNS-Riz Mali, as well as Erika Styger and Devon Jenkins from SRI-Rice. This four-day workshop brought together over 60 participants from all 13 countries that are part of the West Africa Agriculture Productivity Program (WAAPP) to discuss the progress with SRI in 2014 and to plan country and regional activities for 2015 under the 3-year project "Improving and Scaling up SRI in West Africa," for which SRI-Rice provides technical support and advice. Erika Styger and Devon Jenkins were part of the co-organizers with CNS-Riz from Mali and the FIRCA/WAAPP from Côte d’Ivoire. 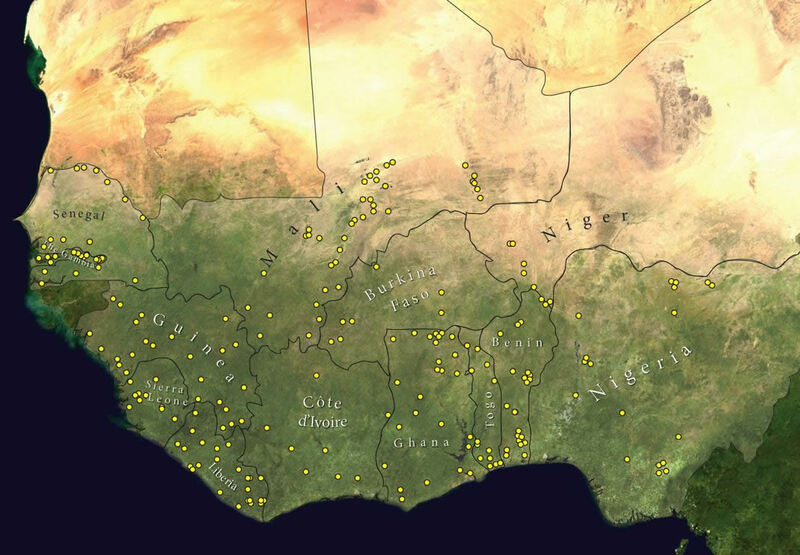 Devon has prepared a map for SRI-WAAPP of the current SRI trials and training sites in West Africa (Click on map at right to see details). The SRI-Rice Twitter surpassed 1,000 followers and our SRI-Rice Facebook page has passed the 1,500 mark for "likes" this month. Thanks to all who are interested in keeping up with SRI by reading our tweets and reading our posts! Our SRI-Rice Selected News Updates for January (on ScoopIt) as well as the January additions are now available. During the first month of 2015, 3,896 unique visitors from 85 countries viewed 9,526 pages on the SRI-Rice website. An SRI and Arsenic in Rice Workshop was held at the Central Bicol State University of Agriculture, Naga, Philippines, on February 13-15, 2015, to prepare research collaborators from six countries for the upcoming research on arsenic in rice led by SRI-Rice and scientists from several departments at Cornell University. Photos of the event are available on the SRI-Mas website. The project, entitled "Reducing Inorganic Arsenic Levels in Rice by Appropriate Water Management," is a collaboration between Cornell scientists and researchers in Indonesia, Malaysia, Mali, Nepal, Philippines, and Sri Lanka, who will test reduced water-use practices associated with SRI in order to determine whether arsenic can be reduced in rice across a range of soils, while maintaining yields. 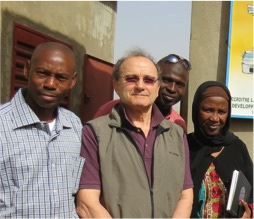 Dr. Jean-Claude Balcet, an agro-economist and Africa specialist currently working with the World Bank, has joined SRI-Rice as a Visiting Scientist and Advisor for the project Improving and Scaling up SRI in West Africa. Our SRI-Rice Selected News Updates for December (on ScoopIt) are now available. The December additions to our website are also ready, so you can find what's new on SRI-Rice online since last time you checked in! Some of the SRI-Rice statistics for December 2014 are as follows: 3,838 unique visitors (3,851 last month) from 92 countries (95 last month) viewed 9,002 pages (10,386 last month) on the SRI website. Total Facebook views: 2,083 (1,917 last month) with 1,473 all-time likes (53 new this month). Twitter followers: 973 (18 new this month).